What you’ll get from this page: A guide that you will want to reference throughout your development. 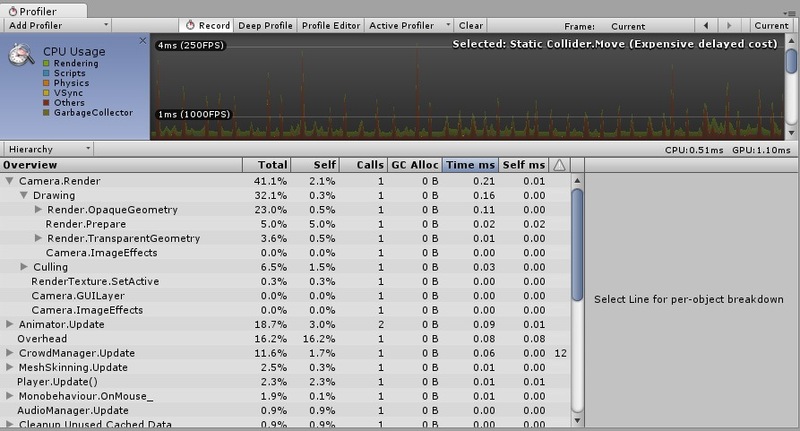 Follow these great tips from Unity field engineer Valentin Simonov that will help you set up a smart and efficient development pipeline, and ultimately ship better and more performant content. The most important part of any software development project because decisions made in the this phase will be difficult to change later on in the development cycle. Check that all planned features actually work on all target platforms. Define the minimally supported device(s) for your content. Have them available to your development and QA teams. Do this, and you’ll be able to set a realistic performance and frame budget. Frame and asset budgets don’t get set early on. models — how many vertices is the target device able to render? assets — how detailed should models and textures be? scripts and rendering — what % of the frame do you have for logic, rendering, effects and other subsystems? Scene and prefab decomposition don’t get set early on. ... or (in other words) everyone works in the same scene. Split levels into (additively loaded) scenes. Move separate objects into prefabs and edit them in separate scenes. Agree on the main scene locking mechanism. This process is all about getting assets according to the specs from artists into the project. If possible, involve a technical artist from the beginning to define this process. Define clear guidelines on asset formats and specs. Set up a build machine, or, turn on and set up Unity Teams. How will a feature be published to the release build? How are the new builds tested? 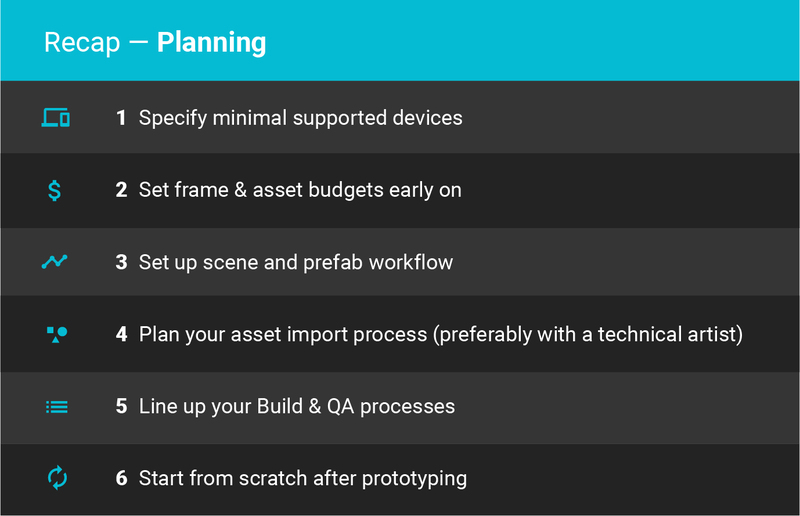 After building a prototype and getting it approved by the management, strongly consider starting it from scratch. Decisions made during prototyping usually favor speed. Basing your game on a bunch of hacks is not a good start for any project. Wrong practices and mistakes during development slow the team down and undermine the quality of the final product. Use text serialization (by default in Unity). Set up built-in YAML merge tool. See more about SmartMerge here. Set up commit hooks. See more here. Switching platforms decreases development speed. 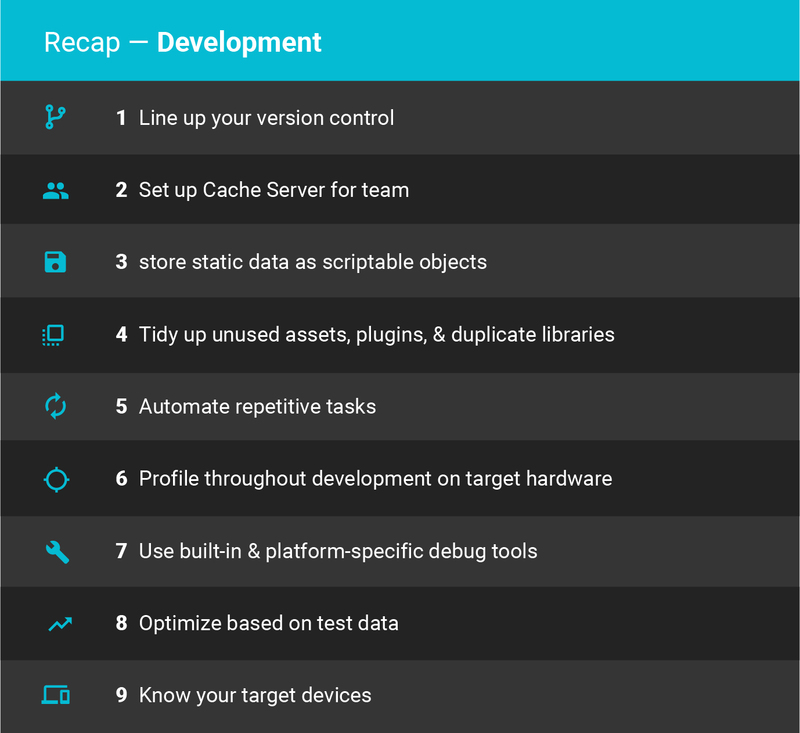 Make sure to set up the new open source Cache Server for your team. This results in slow loading. Instead, for built-in static data use ScriptableObjects with custom editor tools. 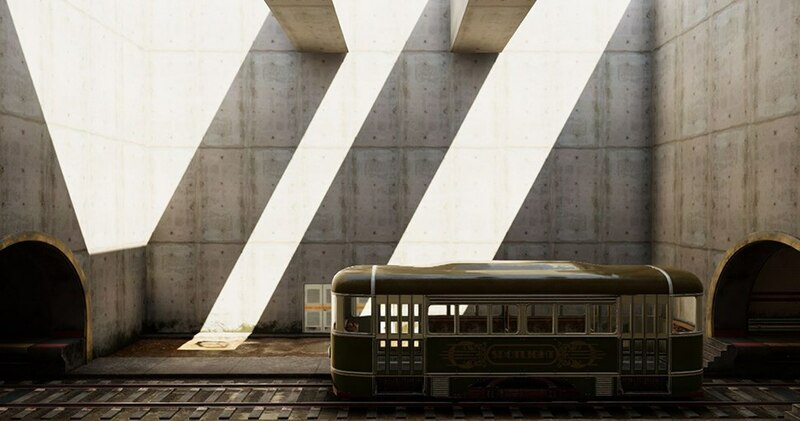 There’s a great chance that unused assets in your project are getting built into the game. Make sure that you don’t leave garbage in your project — if you set up a version control system, restoring files should be easy. Check what dependencies assets from the Asset Store drag into the project. You might be surprised realizing that you have 5 different JSON libraries in the project. Outdated assets and scripts from early prototypes. 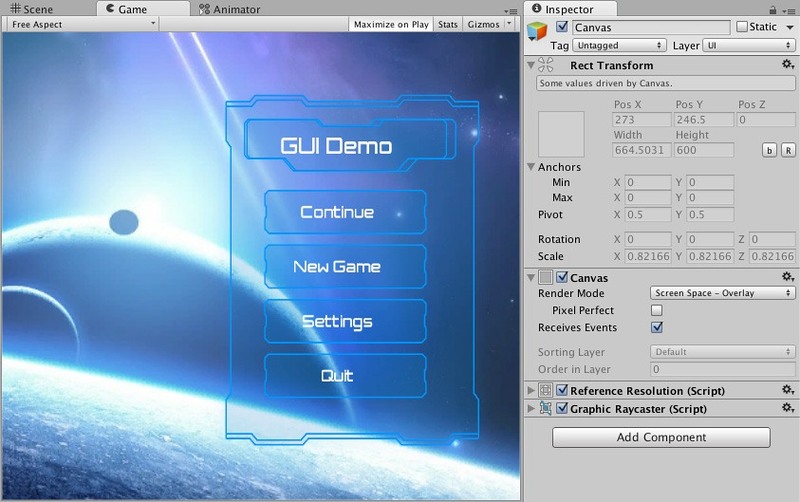 The practice of moving old assets to "removed" folder still results in resources and scripts being built into the game. For every repetitive task there should be a script automating it. Make sure that you can "play" the game or interactive content from any scene. Automate all the steps of build process, so that the application can be built with Cloud Build or locally with a press of a button. Always profile the content on your target device; if you profile in the Editor only, you can miss actual performance bottlenecks. 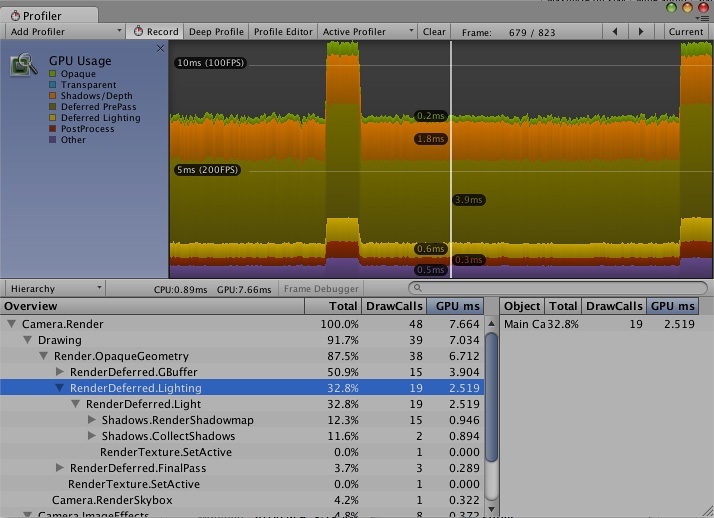 Use the built-in Unity Profiler, Memory Profiler and Frame Debugger. Platform-specific tools include Xcode Instruments, Mali Graphics Debugger, Renderdoc, etc. The longer you wait with profiling, the larger the performance costs can become. Start profiling early on, so you’re sure your project fits into the frame, memory and disk size budgets. Make sure that you are optimizing actual bottlenecks. Use the Tools specified above to gather correct data. Make sure you have enough knowledge about your target platform(s). Desktop, mobile and console platforms have very different bottlenecks. Assets (models, textures, sounds) take up most of the size of your game. Having just one wrong mesh in the project can nullify all the optimizations your programmers have done. 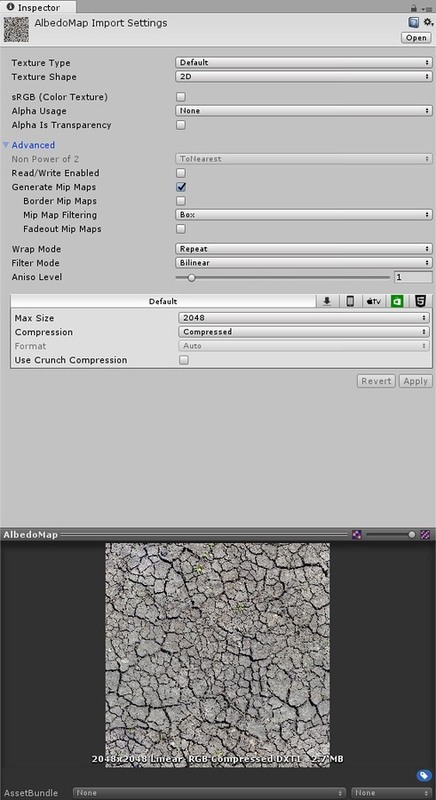 Use 3rd-party tools (like Texture Packer) to create atlases or group sprites together in Unity. This will reduce the number of draw calls in the game. What compression does the platform support? Do the textures need mip maps? Prevent artists from committing textures with wrong settings. It is easy to make a mistake in setting up Asset Bundles build system. Get good guidelines here. It is especially bad for duplicated textures. Use Asset Bundle browser to track dependencies. Poor practices and mistakes in code architecture and development result in low productivity. Abstract Enterprise code is rarely justified. It makes code harder to reason about. It runs slower and IL2CPP has to generate more code. 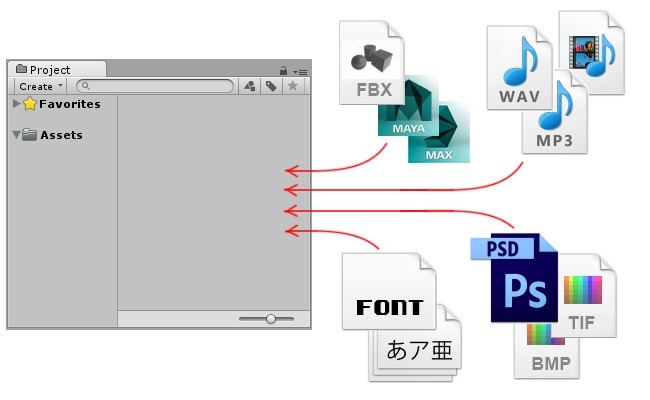 Config formats (files, properties, assets). Events (Unity events, C# events, SendMessage). Which manager is responsible for which objects? When Awake, OnEnable, Update and other methods are called. Either "it just works this way" or abusing Script Execution Order. Use Time.deltaTime for FPS independent scripts. High CPU usage results in "laggy" gameplay experience and drains the battery faster. Native -> Managed calls have some overhead. See this blog post for more details. Now all your scripts have Update() method. Logging and saving game state. Create pools of objects at the start of the game. Reuse objects instead of creating new ones. Even small allocations every frame will sooner or later cause a GC spike. Try to eliminate ALL allocations. High GPU usage results in low framerate, drains battery faster and the game/content is perceived as "running slow". Mobile GPUs can only draw so many pixels per second. 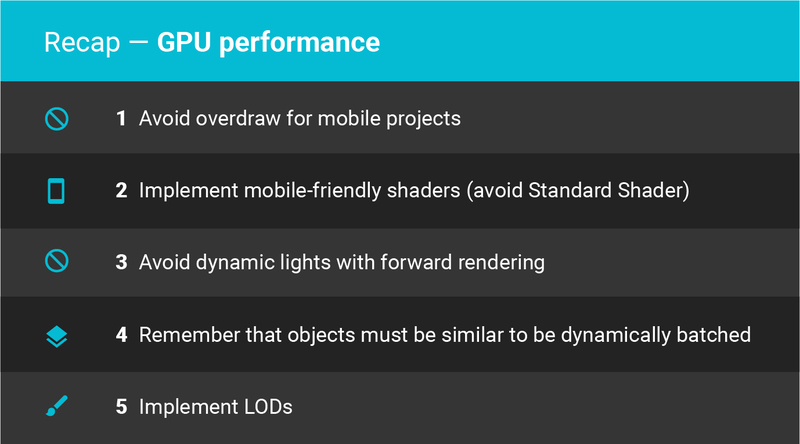 Overdraw is one of the biggest performance bottlenecks on mobiles. Don’t draw unnecessary transparent images. Use more complex meshes to crop fully transparent areas. Don’t use Standard Shader on mobiles. Use simplified versions or turn off some effects for low-end devices. Every light adds a render pass for every illuminated object. Objects must be "similar" to be dynamically batched. Frame Debugger shows why certain objects were not batched. 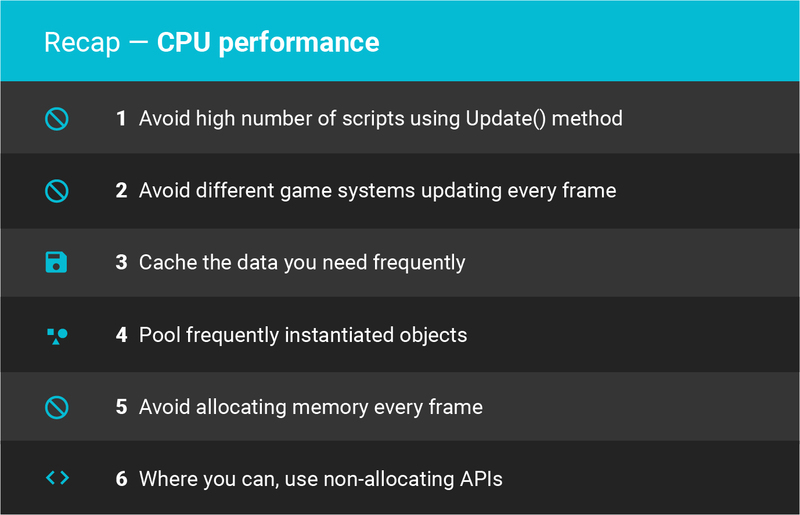 Unity UI is a very artist friendly tool, but it is rather easy to set it up incorrectly, so it would consume much CPU and GPU resources. When a new window or a big chunk of UI is created the game experiences a noticeable lag. You should minimize this effect. Make UI windows less complex. Dynamically reuse list items instead of creating all of them at once. Create a nested Canvas in the list. Use open source implementations, such as this. 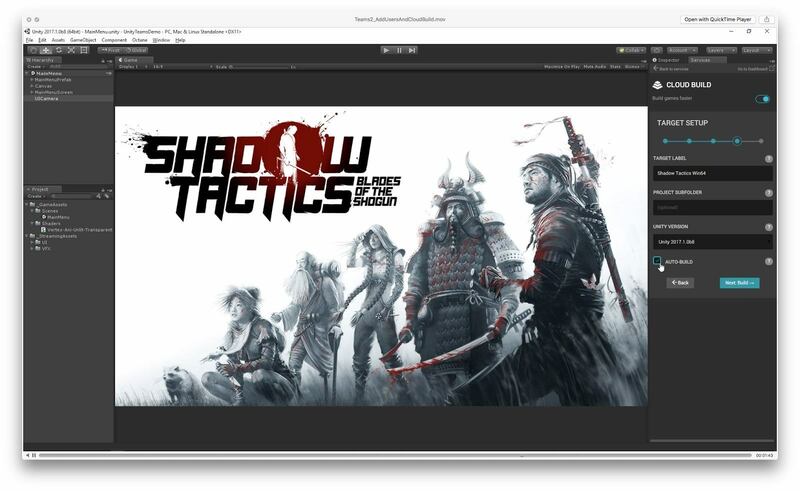 Sign up to receive weekly tech and creative know-how from Unity experts.